The Coimbatore Medical College and Hospital (CMCH), has recently announced its plans to launch a nursing college within their campus in Peelamedu. As an expression of interest to offer degree courses in nursing education (the institute offer diploma courses at present), they have submitted a proposal to the Medical Council of India and the Nursing Council of India (NCI), seeking a go-ahead to start the college. CMCH views this initiative as a workable framework to the prevailing situation of private colleges offering a degree course at an exorbitant fee; as opposed to just a diploma course being offered at CMCH. CMCH runs a nursing school within the government hospital campus, which has a considerable intake of 150 students per year. “However, students who want to join us after a degree are now forced to apply at private colleges,” said CMCH dean Dr Edwin Joe. “We have the space to start offering the course and are planning to put up new buildings. We have all the facilities and a hospital too for them to intern and practice in,” he added. The college has applied to the NCI for license to start offering courses next academic year. “We expect them to sanction an intake of 50 students a year since we are just starting out,” he said. 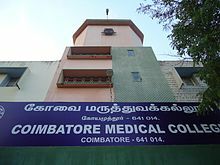 A majority of other government medical colleges and hospitals in Coimbatore offer comprehensive courses through their set up of nursing colleges in the state. With specialized interest in nursing education, this step by CMCH is evident of the growing student population in the state, who wish to pursue their higher education for delivering efficient nursing services. CMCH intends to join the existing bandwagon of Institutes such as the Madras Medical College, Madurai Medical College and Chengalpettu Medical College, which already have a nursing college operational in Coimbatore. .